The bowl season turns up the heat in late December, as the Liberty Bowl, Insight Bowl, and Champs Sports Bowl will all be played on December 29th. The Liberty Bowl pits South Carolina against Conference USA champion Houston, and both head coaches will be looking to win their first bowl game at their current school. Two steady programs will play each other in the Insight Bowl, as Minnesota will face Texas Tech in an offensive juggernaut showdown. Lastly, Purdue and Maryland will play in the Champs Sports Bowl. The Terps were one win away from the ACC title game, while the Boilers won three out of their last four games to end a solid season. 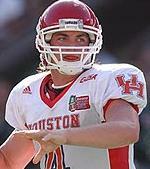 Kevin Kolb may be the most underrated player in college football. The Houston quarterback had a 9-to-1 touchdown-to-interception ratio this year as he threw for 3423 yards and 27 touchdowns. Donne Avery and Marshall Vincent are his two favorites targets. The duo caught over 120 passes for more than 1500 yards combined. Jackie Battle and Anthony Aldridge will split carries, giving Houston a balanced attack that is ranked 6th in total offense. South Carolina, meanwhile, isn't the prototypical SEC team. Their defense doesn't dominate you like an LSU or Auburn. Instead, they rank just 46th in total defense. Junior linebacker Jasper Brinkley leads the team in tackles with 96 and tackles for loss with 12. South Carolina is second in the SEC in sacks, and freshman Eric Norwood leads the team in that category with seven. The Gamecocks will have to get pressure on Kolb if they want any chance of shutting down Houston. The only team to keep UH under 23 points was Miami (FL), who ranks 14th nationally in sacks. South Carolina further separates themselves from the SEC with their offense. USC will play with a spread attack, and Blake Mitchell will be South Carolina's quarterback. However, don't be surprised to see multi-talented Syvelle Newton taking snaps at times. Cory Boyd is the running back in an offense that is usually centered around passing. Boyd rushed for 729 yards and 6 touchdowns this fall. The key to the South Carolina offense, though, is star wide receiver Sidney Rice, who was just 49 yards short of 1000 yards receiving. He caught 64 passes and 9 touchdowns on the season as well. The Gamecocks need to find a way to get Rice the ball to keep up with the Houston offense. Houston will have to shut down Rice to shut down South Carolina. Their 66th ranked defense has shut down two stellar wide receivers already this year, holding Rice's Jarrett Dillard to 34 yards, his lowest total of 2006, and keeping Mike Walker of UCF out of the end zone. However, at times this year, Houston has been sluggish on defense. The game will depend on which Cougar team shows up. If Houston can keep Rice out of the end zone, they should be able to control the game. Kevin Kolb will be trying to prove to NFL scouts that he is a superstar quarterback worthy of playing on Sundays. South Carolina will have to get pressure on Kolb. They will have the better athletes on the field. Look for some trick plays by the Coach Spurrier to open the game. The team that has to play from behind early will have a hard time winning this game. Luckily for Minnesota, their offense can put up some impressive numbers, though not like Texas Tech. Senior quarterback Bryan Cupito will have to have an insane game to keep the Gophers close if the defense doesn't show up. Amir Pinnix rushed for over 1000 yards in a solid year, and he should be able to exploit Tech's poor run defense. Matt Spaeth is a very talented tight end, and he is the target when the Gophers get into the red zone. Cupito's favorite target, Logan Payne, led the team in receiving yards and receiving touchdowns. Minnesota will have to score in the 30s or 40s to win this game. We will see if Cupito and company are up to the challenge. Texas Tech has had moderate success on defense this year. The Red Raiders struggle when it comes to stopping the run, but they are second in the Big 12 in pass defense. They have been able to get away with average defense for years because their offense allows for high-scoring wins, and it's hard to imagine this game being any different. Recently, Texas Tech has been an offensive powerhouse. They had another great offensive year this season, led by quarterback Graham Harrell, ranking Tech's passing offense third in the country. Their running game, as usual, leaves something to be desired. Only six teams in the nation have rushed for less yards than Tech. However, their passing prowess outweighs the lack of run support, as receivers Robert Johnson and Joel Filani have both caught over 10 touchdown passes. Minnesota's chances hang on their pass defense. Will they be able to shut down the powerful passing attack of Texas Tech? It will take an extremely big effort from the Gophers, who rank 112th in total defense nationally. William Van DeSteeg is a lone bright spot on the defense, with 9 sacks during the year. Minnesota does lead the nation in turnover margin, though, with 29 takeaways and 13 giveaways. If Minnesota can shut down Tech's passing attack and get Pinnix a steady amount of carries, they should be able to bring home the win. However, whether they can slow down Texas Tech is still questionable. If Tech can score at will, then I don't see how Minnesota can keep up. This should be the highest-scoring contest of the entire bowl season. Just like Texas Tech, Purdue makes up for poor defense with their powerful offense. Sophomore Curtis Painter leads the highest ranked offense in the Big 10. While Painter threw an impressive 21 touchdowns, he was also intercepted 18 times. Kory Sheets led the team with rushing 11 touchdowns, though Jaycen Taylor should also see some carries. Purdue has three wide receivers who have 50 catches or more, and Dorien Bryant leads the trio with 79 receptions, 967 yards, and six touchdowns. Purdue must avoid costly turnovers to succeed on offense. Maryland lost to Boston College and Wake Forest to end the season, giving up 38 points both times. UM never lost a game where they didn't give up over 26 points. Erin Henderson and Wesley Jefferson are ranked 2nd and 3rd in tackles in the ACC. If Maryland does give up a lot of points, watch out for Josh Wilson. The senior is a solid kick returner who has already returned one kickoff for a touchdown. He averages 28.1 yards a return. Maryland had a great year, though late-season losses kept them from playing for a BCS bowl bid. However, that doesn't mean that they dominated their opponents en route to their eight-win season, as their average margin of victory was just 5.5 points. Maryland is fairly bland offensively, and they never scored more than 28 points in a game and rank 96th in total offense. Quarterback Sam Hollenbach had an up and down year, throwing 13 touchdowns and 11 interceptions. Running backs Lance Ball and Keon Lattimore, meanwhile, combined for over 1000 yards and 11 touchdowns. Freshman Darrius Heyward-Bey led all UM wide receivers in receptions, yards, and touchdowns. Purdue struggled defensively throughout 2006. The Boilermakers and their 114th ranked defense gave up an average of 26.9 points a game, and on average, they give up more than 430 yards of offense per outing. Senior Anthony Spencer collected 10.5 sacks on the year, which is second in the Big 10. Pressuring a mistake-prone quarterback like Hollenbach is crucial to keeping Maryland in check. Purdue's defense needs to keep Maryland in check. They don't have to shut them down, but they need to keep them in the 20s. Their offense should be able to score a bunch of points. However, if Maryland can force Purdue to turn the ball over, they can control the game with the run. That would keep Purdue's dynamic offense on the sideline, and the Boilers' feeble defense on the field.